Jaded Blossom: Some Sweet Treats! Hey, it is Melissa from M Miranda Creations, and today it's my turn to post here on the JB blog. I'm super excited to be sharing my project with all of you today! I have made some treat boxes for my kiddo's teachers and also came up with an idea for treat bags for my daughter's class. I think they both came out super cute. 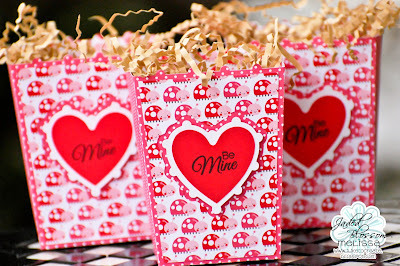 I used the Jaded Blossom Simple Sayings Valentine Edition, the Mini Tag Dies 2 and Valentine's Treats (retired). The treat boxes are from SVG Cuts' Carousel Ride SVG kit. I used Doodlebug Design paper and stamped the center of the heart using the Be Mine sentiment. I made three of these treat bags so far. Only 19 more to go. LOL! I took a 3.75" x 6" treat bag and filled it with Rolos. Yum!!! I cut the tag using Doodlebug Design paper and then cut the banner using white cardstock. On the banner, I stamped the You're Sweeter than Chocolate sentiment and then popped it up with foam tape onto the tag. 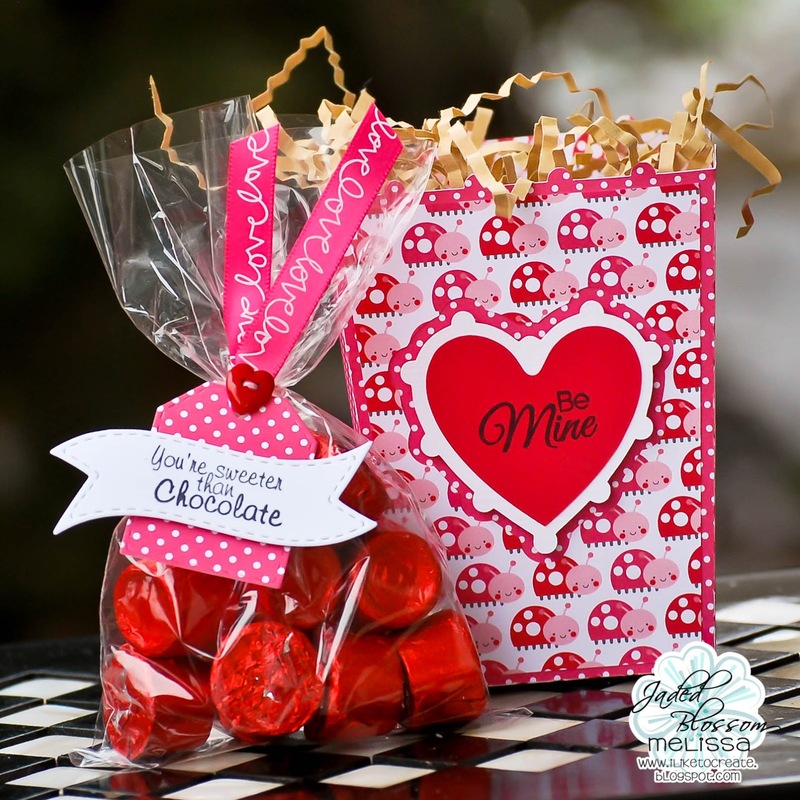 I threaded some fun ribbon through the tag and attached the tag to the treat bag using a heart shaped button and some Trendy Twine. Don't forget to link up your projects for the January Challenge and head on over to the JB store to pick up some fun dies and stamps for all your Valentine's Day treats!!! Fun treats! The box is just adorable and the way you dressed up the bag of rolo's is awesome! The tag and banner are so cute! I absolutely love the pretty tag on the adorable treat bags! !